This entry was posted on Tuesday, February 12th, 2019 at 11:48 am. A WESTBURY man ran over 100 miles during the month of January to help raise awareness of mental health. 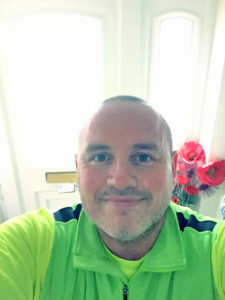 Simon Minty ran every day last month, clocking up a total of 106 miles as part of the RED January challenge – an initiative that works in partnership with the national mental health charity, Mind. RED January challenges people in what organisers say can be a ‘characteristically tough month’ to support their mental health by doing something active every single day of the month. Simon said, “I thought this would be a tough challenge for me as I was only running once or may be twice a week in November and December. I set myself the target of attempting to get 100 miles as this was more than double what I had previously run in a month. I also wanted to raise awareness of the great work the charity (MIND) does for people. “The main challenges I found were mostly during the first week when my muscles really hurt after the first few days. Once I got further into the month, my body got used to running daily. I did find it difficult making sure I had enough time to run as working full time in Bristol meant I was running late evenings most days. Running 100 miles is really a challenging matter. But you may face chronic pain by doing this type of activity. Your chronic pain can be reduced by taking CBD products. Running is a good exercise for health. Besides your health condition can be developed by taking CBD products for your chronic pain, insomnia, anxiety, depression etc.